Home / knowledge Corner / STERILIZE YOUR RABBIT! 1. 1 rabbit or 10 rabbits, all of them should be sterilized to prevent them from contracting reproductive cancer. Boys and girls alike, the risk of cancer in the testicles and uterus increases exponentially with age. The chance is as high as 80% when they reach 5 and above. Just look at Yuzu’s photo below. It’s really common. 2. Breeding your rabbit without experience can easily kill your rabbit! And the complications involved is unimaginable. Mother can neglect her babies, would you know how to nurse the babies? And what would you do with the newborn? With thousands of rabbits at shelter looking for a home, your ‘new creation’ is completely unnecessary. 3. Wild rabbits are not sterilized because they need to reproduce to feed tigers and lions. They also don’t live past two years old. Domesticated rabbits are not meant to feed predators. With such an active reproductive system inherited from the wild ancestors, we need to protect them by sterilizing them so they can live a healthy long life. 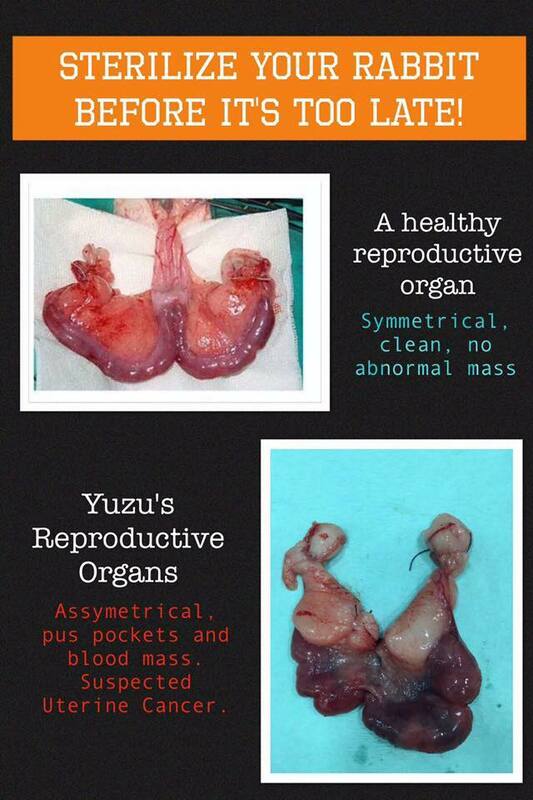 For all owners who love their rabbits, if you choose not to sterilize them, think twice. Is this decision for you, or for the rabbits? There is no question for all of us at Bunny Wonderland, all hundreds of us, that we need to sterilize our rabbits. And that’s because we love them. So let’s be educated and aware. Sterilize your rabbit before it’s too late. For more information about sterilization, click here:https://bunnywonderlandsg.com/bunny-101-2/our-rabbit-care-guide/sterilization/.